Since Marijuana is legal in CA, how can I prevent “high” employees on the job? Although recreational use of marijuana is legal under state law as of 1/1/18, employers can modify their Zero-Tolerance/Drug-Free Workplace Policy to ensure that employees who are impaired on the job – even with recreational use of marijuana – violate company policy. Contact us to update or create a compliant Zero-Tolerance/Drug-Free Workplace Policy. Reminder – Minimum Wage Increase. 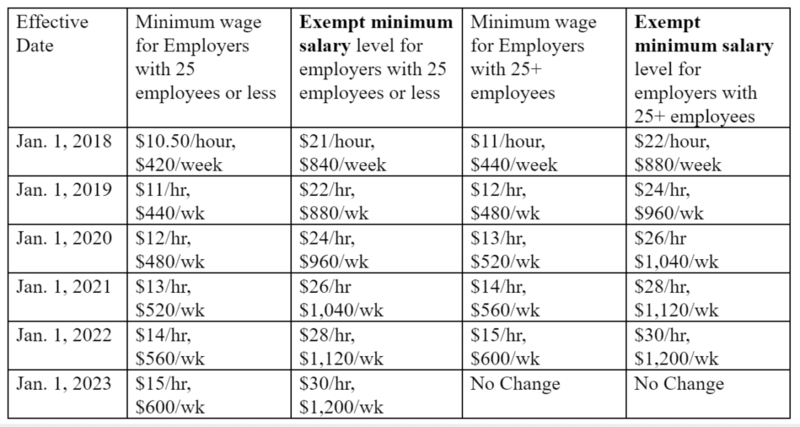 While most employers are aware of the increase to the minimum wage, employers should also be sure the salaries of their exempt “executive,” “administrative,” and “professional” employees are increased accordingly to be twice the minimum wage. Please refer to the chart below. If your employees are not paid at these rates and/or do not meet the exempt duties tests to be salaried, you must pay overtime rates and provide other benefits required for hourly employees. Please don’t just assume you can pay employees a salary. Check with us to confirm that their job duties fit within an approved exemption. Where are my 2018 Tax forms? You’ll note that the W-4 forms on our Resources page are still dated 2017. The IRS released a statement that Employers should continue to use the existing 2017 forms, withholding tables and systems while they develop the new 2018 forms that implement the tax reform bill signed by President Trump on December 22, 2017. According to the IRS, these new forms will be available in February. See the December 26, 2017 IRS statement here for more information. Once the IRS releases the new forms, they will be able on our Resources page. Until then, use our existing links to both the English and Spanish 2017 W-4 forms. Employers are Prohibited from Inquiring about an Employment Applicant’s Salary History. Effective January 1, 2018, employers may not collect information from an employment applicant regarding the applicant’s salary history, compensation, or benefits, unless volunteered by the applicant. In addition, employers must provide the applicant with a pay scale of the prospective position upon reasonable request. One important principle guiding this new law is to ensure equal pay for all genders. Contact us to discuss your hiring processes and updating your employment applications immediately. California Adopts “Ban the Box” Legislation. Beginning January 1, 2018, employers with 5 or more employees are prohibited from asking an applicant for employment to disclose criminal convictions, until after an initial conditional offer of employment has been made. The new law also requires any employer that intends to deny an applicant a position based solely on their conviction history to make an individualized assessment of whether the applicant’s conviction history has a direct and adverse relationship with the specific duties of the job. To ensure that you have compliant interview questions and applications, contact us. Transgender Rights in the Workplace/Gender Identity and Expression. Effective January 1, 2018, employers with 50 or more employees are now required to provide harassment training to supervisors that covers harassment based on gender identity, gender expression, and sexual orientation. Covered employers must also display a poster developed by the Department of Fair Employment and Housing (DFEH) regarding transgender rights and in a prominent and accessible location in the workplace. You can find that poster and other required DFEH posters on our Resources page. Further, a myriad of new regulations adopted in 2017 by the DFEH address issues related to employee gender in the workplace, including requiring employers to permit employees to dress in accordance with their gender identity, use gender neutral employee restrooms, and be addressed by their preferred name and pronoun. Contact our firm immediately to update your Harassment, Discrimination, and Retaliation polices, posters, acknowledgments and Handbooks, to comply with new law. We are here to answer your questions regarding these new regulations or about handling personnel issues, and can provide compliant training for your business. The Immigrant Worker Protection Act. Employers may no longer consent to a search of non-public areas of a workplace by immigration enforcement agents without a warrant, or permit an immigration enforcement agent to inspect the employer’s employee records without a subpoena or court order. Employers must also notify employees within 72 hours of receiving a federal notice of an inspection of I-9 forms or other records to be conducted by an immigration agency. Copies of I-9s must also be provided to employees upon request. Contact us for more details about the Immigrant Worker Protection Act. Proof of Sexual Harassment Prevention Training Required for Renewal of Farm Labor Contractor Licenses. Farm Labor Contractor License renewals must be accompanied with a complete list of employees trained and a list of all materials utilized to provide sexual harassment prevention training, in the calendar year prior to the month the renewal application is submitted. The new bill also requires sexual harassment training to be in a language understood by the employees. Get in touch with our office to be sure you are providing all the required training to your employees. New Industries Required to Post Human Trafficking Notice. Hotels, motels, and bed and breakfast businesses or inns are now required to post a revised notice regarding human trafficking and slavery. Contact our office to find out whether your business is required to post the new Human Trafficking Notice. We have the proper notices in English and Spanish for your convenience. Expansion of Parental Leave Rights. The California Family Rights Act (CFRA) has been amended to require certain employers with 20-49 employees to provide up to 12 weeks of unpaid parental leave – only for the purpose of bonding with a newborn child, adopted child, or foster child within a year of birth or placement. Employees must be employed for more than 12 months, or have worked 1,250 hours of service with the employer to qualify, and their positions must be held open for this period of protected leave. If you have questions about the CFRA, the Family Medical Leave Act, or Pregnancy Disability Leave, be sure to contact us. Labor Commissioner Authorized to Pursue Retaliation and Discrimination Uncovered During Wage Claim Investigations. Labor Commissioners are now authorized to pursue retaliation and discrimination claims, with or without a specific employee complaint, if such conduct is uncovered during a wage claim investigation. Further, Labor Commissioners can obtain injunctive relief from the superior court if there is reasonable cause to believe that the employer retaliated or discriminated against any employee. The bill also authorizes injunctive relief to employees who are bringing a civil action for retaliation or discrimination. Contact us for information on precautions you can take before a Labor Commissioner wage investigation. California Religious Freedom Act/Prohibition of Religious Discrimination. No state or local agency, or public employee, can now disclose to the federal government personal information about a person’s religious affiliation, beliefs or practices, when the information is sought in order to compile a database of individuals based on religious beliefs, for law enforcement or immigration purposes. State and local agencies are prohibited from assisting in creation of such a database, unless the creation is part of a targeted investigation. Contact us to determine whether this new religious freedom law affects your business. Direct Contractors may be Liable for Wage Claims of Subcontractors’ Employees. Beginning January 1, 2018, in private construction projects, any direct contractor who accepts a contract for the erection, construction, alteration, or repair of a building or work must assume liability for any debt owed to a wage claimant that is incurred by a subcontractor, where the claimant performed work for the subject of the contract. Subcontractors are now required to provide information and reports to the contractor regarding employees’ work hours and wages paid, and the direct contractor is permitted to withhold disputed sums if the subcontractor fails to provide requested information. This new law may obligate subcontractors to prepare certified payroll reports, similar to public works requirements. Concerned you may now be liable for your subcontractors? Contact our office for information on best practice. See our Resources page at: http://karensloatlaw.com/resources/ for new hire forms and other governmental forms and pamphlets conveniently gathered for you to download, use or complete for all employees. Remember, we offer employers a complimentary review of employee Handbooks, Personnel Policies and Personnel forms. Get in touch with us if you have any questions about these new laws, our 2018 Employment Law updates, or anything on our Resources page. We’re happy to help!